Toe Up socks in Knit Picks Essential TweedThe yarn was a present from my friend CL in Canada a few years ago. It’s made a lovely dense fabric and is very soft after one wash. However I don’t know how long the coloured flecks will last as they’re very loosely combined with the yarn. 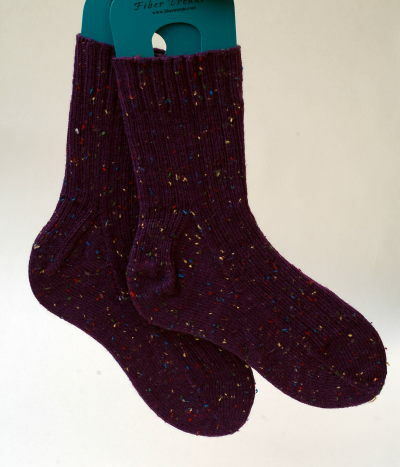 Toe Up socks in Knit Picks Essential TweedThis pair were knitted toe up, two at a time. The feet and body of the socks are in 3×1 rib and the cuffs 2×2 rib as I like my socks to stay up. I decided to use a simple rib as the flecks would detract from a more complicated pattern. 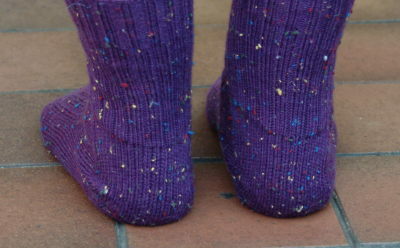 Toe Up socks in Knit Picks Essential TweedOverall I’m pleased with them but would have liked them to be a bit longer. >I love the flecky effect on them. They look lovely and comfy. >They turned out really well! >They do look comfy, and a lovely colour too. Hope the flecks stay but they will still be nice even if they don't.